For other uses, see Bramble (disambiguation). Bramble in Manchester, England. Note the unripe fruit on second-year side shoots in the background and late flowers (13 August 2017) from the tip-flowering of first-year growth. A bramble is any rough, tangled, prickly shrub, usually in the genus Rubus, the blackberries and raspberries and dewberries. "Bramble" is also used to describe other prickly shrubs such as roses (Rosa species). Bramble or brambleberry sometimes refers to the blackberry fruit or products of its fruit, such as bramble jelly. In British English, bramble usually refers to the common blackberry, Rubus fruticosus. Rubus fruticosus grows abundantly in all parts of the British Isles and harvesting the fruits in late summer and autumn is often considered a favourite pastime. 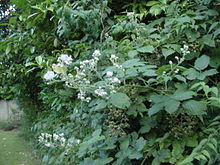 An especially hardy plant, bramble bushes can also become a nuisance in gardens, sending down strong suckering roots amongst hedges and shrubs and being particularly resilient against pruning. 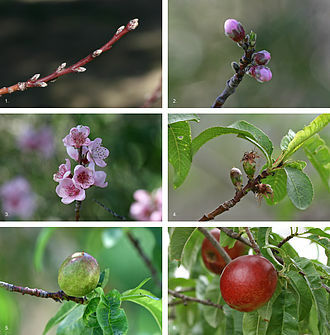 Many consider R. fruticosus a weed due its tendency to grow in neglected areas and its sharp, tough thorns which can be hazardous to children and pets. "Bramble" comes from Old English bræmbel, a variant of bræmel. It ultimately descends from Proto-Germanic *brēm-, whence come also English broom, German Brombeere, Dutch braam and French framboise. Split bramble stems are traditionally used as binding material for straw in production of lip-work basketry, such as lip-work chairs and bee skeps and sometimes used to protect other fruits such as strawberries. Bramble leaves can be used to feed most Phasmatodea. Young leaves contain a toxin that can be harmful to many species of Phasmatodea, however this only occurs up until their third instar, by which time they have developed an immunity to it. Rubus fruticosus is difficult to eradicate once it has become established. Early action by hand pulling with a gloved hand and digging young seedlings as soon as they are seen will save a lot of hard work later. A thick mulch of chipped bark or compost will also make it much easier to pull out recently germinated seeds in the spring. 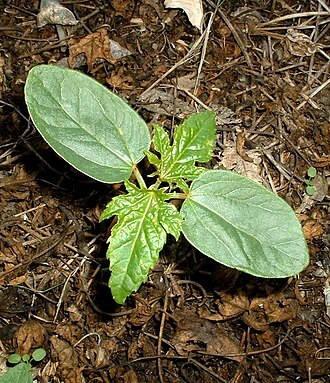 Light but established infestations in friable, workable soils may be removed by cutting back the stems to about 1 foot (300 mm) above the ground, to leave a handle, and forking out the bramble stump with as much of the root as possible. Anything left below-ground may regenerate. Heavy infestations may make the land completely impenetrable and will require cutting first just to access the stems. The root systems will also be so pervasive that removing them would require digging up the entire area; doing this in woodland areas will cause unacceptable damage to the surface roots of trees and to flowering bulbs and should be avoided. In this case, chemical control using a selective weedkiller such as triclopyr to wet the photosynthesising bramble leaves is very effective if applied in accordance with the manufacturer's instructions. However, a heavily infested area of uncut brambles will require an inordinate amount of poison to wet the leaves; it is far cheaper, and more effective, to cut the area as close to ground level as possible in the spring, clear the debris into piles to reveal the ground surface and to accurately spot spray the shoots that will emerge two to three weeks later as soon as they have a small amount of new foliage. This will kill the plant back into its root system using a small fraction of the poison required to spray whole bushes. 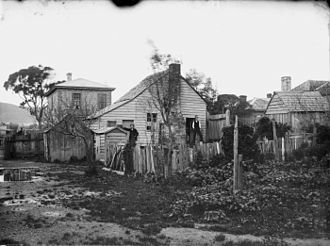 The area may first be cleared using a tractor-mounted rotary mower, motorised string trimmer or with a scythe. A short-bladed, 24 inches (610 mm), scythe in good hands can be faster than using a string trimmer, leaves a neater cut close to the ground, avoids collateral damage to other plants that are desirable to keep, and deposits the cut debris aligned in swathes that are easier to remove and stack. The area must be cut and cleared at some point anyway and it is easier to clear the debris while green and flexible than dead and dry, so clearing when green then spraying a little is more efficient than spraying a lot then clearing when dry. Triclopyr is highly selective, it only affects actively photosynthesising dicots, leaving grass, and flowering monocots such as narcissus and bluebell bulbs, undamaged. It also breaks down harmlessly in the soil within about six weeks leaving no toxic residuals. Glyphosate is also effective but must be used with much greater care and will damage other woodland plants. There are many different systems developed for the commercial culture of blackberries and raspberries. 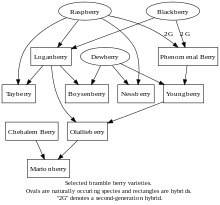 Bramble cultivars are separated into several categories based on their growth habit. 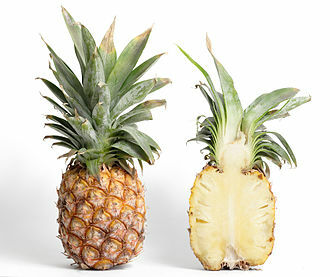 They are categorised as erect, semi-erect, or trailing. ^ a b c "the definition of bramble". Dictionary.com. Retrieved 2016-02-15. 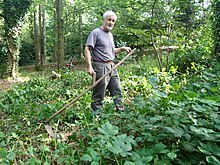 ^ "Brambles and other woody weeds /RHS Gardening". www.rhs.org.uk. Retrieved 2016-02-15. 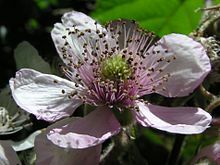 ^ "Bramble or blackberry | Woodlands.co.uk". www.woodlands.co.uk. Retrieved 2016-02-15. ^ "RHS, Brambles and other woody weeds". rhs.org.uk. The taxonomy of the blackberries has historically been confused because of hybridization and apomixis, so that species have often been grouped together and called species aggregates. For example, the entire subgenus Rubus has been called the Rubus fruticosus aggregate, what distinguishes the blackberry from its raspberry relatives is whether or not the torus picks with the fruit. When picking a blackberry fruit, the torus does stay with the fruit, with a raspberry, the torus remains on the plant, leaving a hollow core in the raspberry fruit. In the western US, the term caneberry is used to refer to blackberries and raspberries as a rather than the term bramble. The usually black fruit is not a berry in the sense of the word. 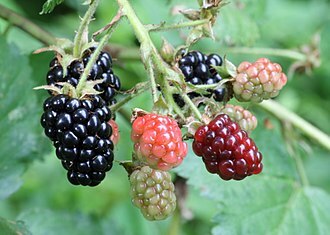 Botanically it is termed an aggregate fruit, composed of small drupelets, blackberries are perennial plants which typically bear biennial stems from the perennial root system. In its second year, the cane becomes a floricane and the stem does not grow longer, first- and second-year shoots usually have numerous short-curved, very sharp prickles that are often erroneously called thorns. These prickles can tear through denim with ease and make the plant very difficult to navigate around, recently the University of Arkansas has developed primocane fruiting blackberries that grow and flower on first-year growth much as the primocane-fruiting red raspberries do. Unmanaged mature plants form a tangle of dense arching stems, the branches rooting from the tip on many species when they reach the ground. Vigorous and growing rapidly in woods, scrub and hedgerows, blackberry shrubs tolerate poor soils, readily colonizing wasteland, the flowers are produced in late spring and early summer on short racemes on the tips of the flowering laterals. Each flower is about 2–3 cm in diameter with five white or pale pink petals, the drupelets only develop around ovules that are fertilized by the male gamete from a pollen grain. The most likely cause of undeveloped ovules is inadequate pollinator visits, incomplete drupelet development can be a symptom of exhausted reserves in the plants roots or infection with a virus such as raspberry bushy dwarf virus. Photosynthesis is a process used by plants and other organisms to convert light energy into chemical energy that can be released to fuel the organisms activities. In most cases, oxygen is released as a waste product. 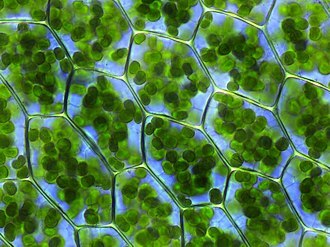 Most plants, most algae, and cyanobacteria perform photosynthesis, such organisms are called photoautotrophs, in plants, these proteins are held inside organelles called chloroplasts, which are most abundant in leaf cells, while in bacteria they are embedded in the plasma membrane. In these light-dependent reactions, some energy is used to strip electrons from suitable substances, such as water, in the Calvin cycle, atmospheric carbon dioxide is incorporated into already existing organic carbon compounds, such as ribulose bisphosphate. Using the ATP and NADPH produced by the light-dependent reactions, the compounds are reduced and removed to form further carbohydrates. Cyanobacteria appeared later, the oxygen they produced contributed directly to the oxygenation of the Earth. Today, the rate of energy capture by photosynthesis globally is approximately 130 terawatts. Photosynthetic organisms convert around 100–115 thousand million tonnes of carbon into biomass per year. 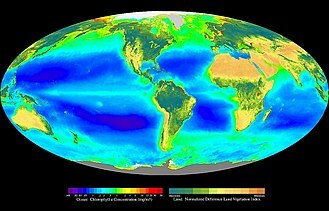 Photosynthetic organisms are photoautotrophs, which means that they are able to synthesize food directly from carbon dioxide, not all organisms that use light as a source of energy carry out photosynthesis, photoheterotrophs use organic compounds, rather than carbon dioxide, as a source of carbon. In plants and cyanobacteria, photosynthesis releases oxygen and this is called oxygenic photosynthesis and is by far the most common type of photosynthesis used by living organisms. Although there are differences between oxygenic photosynthesis in plants and cyanobacteria, the overall process is quite similar in these organisms. There are varieties of anoxygenic photosynthesis, used mostly by certain types of bacteria. Carbon dioxide is converted into sugars in a process called carbon fixation, photosynthesis provides the energy in the form of free electrons that are used to split carbon from carbon dioxide that is used to fix that carbon once again as carbohydrate. The common blackbird is a species of true thrush. It is called Eurasian blackbird, or simply blackbird where this does not lead to confusion with a local species. It has a number of subspecies across its range, a few of the Asian subspecies are sometimes considered to be full species. Depending on latitude, the common blackbird may be resident, partially migratory and this species breeds in woods and gardens, building a neat, mud-lined, cup-shaped nest. It is omnivorous, eating a range of insects, berries. Both sexes are territorial on the grounds, with distinctive threat displays. Pairs stay in their territory throughout the year where the climate is sufficiently temperate and this common and conspicuous species has given rise to a number of literary and cultural references, frequently related to its song. The common blackbird was described by Linnaeus in the 10th edition of his Systema Naturae in 1758 as Turdus merula. The binomial name derives from two Latin words, turdus and merula, the latter giving rise to its French name and its Scots name, merl. About 65 species of medium to large thrushes are in the genus Turdus, characterised by rounded heads, pointed wings, and usually melodious songs. However, in Old English, and in modern English up to about the 18th century, bird was used only for smaller or young birds, at that time, the blackbird was therefore the only widespread and conspicuous black bird in the British Isles. Until about the 17th century, another name for the species was ouzel, ousel or wosel, another variant occurs in Act 3 of Shakespeares A Midsummer Nights Dream, where Bottom refers to The Woosell cocke, so blacke of hew, With Orenge-tawny bill. Two related Asian Turdus thrushes, the blackbird and the grey-winged blackbird, are named blackbirds. 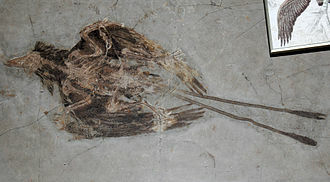 As would be expected for a passerine bird species, several geographical subspecies are recognised. The treatment of subspecies in this article follows Clement et al, a small population breeds in the Nile Valley. Birds from the north of the winter throughout Europe and around the Mediterranean including Cyprus. A larva is a distinct juvenile form many animals undergo before metamorphosis into adults. Animals with indirect development such as insects, amphibians, or cnidarians typically have a phase of their life cycle. The larvas appearance is very different from the adult form. A larva often has unique structures and organs that do not occur in the adult form and their diet may be considerably different. Larvae are frequently adapted to separate from adults. For example, some such as tadpoles live almost exclusively in aquatic environments. By living in an environment, larvae may be given shelter from predators. Animals in the stage will consume food to fuel their transition into the adult form. In some species like barnacles, adults are immobile but their larvae are mobile, some larvae are dependent on adults to feed them. In many eusocial Hymenoptera species, the larvae are fed by female workers, in Ropalidia marginata the males are capable of feeding larvae but they are much less efficient, spending more time and getting less food to the larvae. Butterflies are insects in the macrolepidopteran clade Rhopalocera from the order Lepidoptera, which includes moths. Adult butterflies have large, often brightly coloured wings, and conspicuous, the group comprises the large superfamily Papilionoidea, which contains at least one former group, the skippers and the most recent analyses suggest it contains the moth-butterflies. 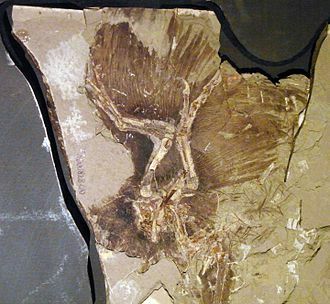 Butterfly fossils date to the Paleocene, which was about 56 million years ago, Butterflies have the typical four-stage insect life cycle. Winged adults lay eggs on the plant on which their larvae, known as caterpillars. The caterpillars grow, sometimes rapidly, and when fully developed. When metamorphosis is complete, the skin splits, the adult insect climbs out. Butterflies are often polymorphic, and many species use of camouflage, mimicry. Some, like the monarch and the lady, migrate over long distances. Many butterflies are attacked by parasites or parasitoids, including wasps, flies, some species are pests because in their larval stages they can damage domestic crops or trees, other species are agents of pollination of some plants. Larvae of a few butterflies eat harmful insects, and a few are predators of ants, butterflies are a popular motif in the visual and literary arts. The Oxford English Dictionary derives the word straightforwardly from Old English butorflēoge, butter-fly, similar names in Old Dutch, the earliest Lepidoptera fossils are of a small moth, Archaeolepis mane, of Jurassic age, around 190 million years ago. Butterflies evolved from moths, so while the butterflies are monophyletic, the oldest butterflies are from the Palaeocene MoClay or Fur Formation of Denmark. The oldest American butterfly is the Late Eocene Prodryas persephone from the Florissant Fossil Beds, the butterflies have been divided into the superfamily Papilionoidea excluding the smaller groups of the Hesperiidae and the more moth-like Hedylidae of America. Butterfly adults are characterized by their four scale-covered wings, which give the Lepidoptera their name, as in all insects, the body is divided into three sections, the head and abdomen. It consists of a cutting head at the end of a long shaft with a handle or handles and sometimes a shoulder strap. The string trimmer was invented in the early 1970s by George Ballas of Houston and his first trimmer was made by attaching pieces of heavy-duty fishing line to a popcorn can bolted to an edger. Ballas developed this into what he called the Weed Eater, since it chewed up the grass, a string trimmer works on the principle that a line that is turned fast enough is held out from its housing very stiffly by centrifugal force. The faster it turns the stiffer the line, even round-section nylon line is able to cut grass and slight, woody plants quite well. These lines make disks less necessary for tough jobs, the line is hand-wound onto a reel before the job is started, leaving both ends extending from the reel housing. The motor turns the reel and the line extends horizontally while the operator swings the trimmer about where the plants are to be trimmed, the operator controls the height at which cutting takes place and can trim down to ground level quite easily. As the line is worn, or breaks off, the operator knocks the reel on the ground so that a mechanism allows some of the line in the reel to extend. Newly extended line operates more efficiently because of its heavier weight, the speed of the spinning hub is usually controlled by a trigger on the handle. For vertical cutting the whole machine can be tilted or some trimmers allow the head to be adjusted at different angles, vertical cutting is not recommended near sidewalks or other concrete and pavement edges, because it leaves open grooves that allow water to collect and cause damage. One of such is an arrangement where the trimmer is connected to heavy machinery and is powered using a hydraulic motor, the head contains a safety shield on the user side and a rotating hub which may be called a head or spool. Advantages of gasoline-powered trimmers include mobility and the maximum power. These very large trimmers are often referred to as brush cutters, brush-cutter types are usually made so that a metal blade can be attached instead of the string. A metal blade enables cutting heavier woody brush, smaller line trimmers have curved driveshafts to make holding the cutting-head at ground level much easier and with less strain on the operator. Hoverflies, sometimes called flower flies, or syrphid flies, make up the insect family Syrphidae. As their common name suggests, they are seen hovering or nectaring at flowers. In some species, the larvae are saprotrophs, eating decaying plant and animal matter in the soil or in ponds, in other species, the larvae are insectivores and prey on aphids and other plant-sucking insects. Some adult syrphid flies are important pollinators, about 6,000 species in 200 genera have been described. Hoverflies are common throughout the world and can be found on all continents except Antarctica, Hoverflies are harmless to most other animals, despite their mimicry of more dangerous wasps and bees, which wards off predators. The size of hoverflies varies depending on the species, like members of the genus Baccha, are small and slender, while others, like members of Criorhina, are large and yellow and black. As members of the Diptera, all hoverflies have a functional pair of wings. They are brightly colored, with spots and bands of yellow or brown covering their bodies, due to this coloring, they are often mistaken for wasps or bees, they exhibit Batesian mimicry. With a few exceptions, hoverflies are distinguished from other flies by a spurious vein, adults feed mainly on nectar and pollen. They hover around flowers, lending to their common name and this is beneficial to gardens, as aphids destroy crops, and hoverfly maggots are often used in biological control. Certain species, such as Lampetia equestris or Eumerus tuberculatus, are responsible for pollination, an example of a well-known hoverfly maggot is the rat-tailed maggot, of the drone fly, Eristalis tenax. It has a siphon at its rear end, giving it its name. The species lives in stagnant water, such as sewage and lagoons, the maggots have a commercial use, and are sometimes sold for ice fishing. On occasion, hoverfly larvae have been known to cause myiasis in humans. This occurs when the larvae are accidentally ingested on food or from other sources, myiasis causes discomfort, pain, or itching, hoverflies do not normally prey upon humans and cases of myiasis from hoverflies are very rare. Hoverflies are a family found in most biomes, except deserts, tundra at extremely high latitudes. A sample of string trimmer heads. From left: A string or line head, a chain trimmer head (now banned in the EU after a fatality), and a metal brush cutting head. A mower with a scythe cuts a swathe through the crop. Swath width of a satellite.